Are All Founders Created Equal? Topping the to-do list is deciding if the founders will split equity evenly or unevenly. While expedient, this approach may not reflect the relative contributions of the founders. Will an equal ownership split impede future decision-making because founders have the same voting rights? There’s no one-size-fits-all answer. Take the time to fully examine the many facets of equity. What factors would favor an uneven split? This is the age-old question of ideation versus execution. Are you betting on the jockey or the horse? The answer is really both. Look holistically at who is investing capital, bringing in key contacts, providing elbow grease and leveraging experience. Decide if more risk and sweat deserve extra equity. When do we tackle this issue? There’s no exact time; it can take years for an idea to turn into a business. However, the equity distribution decision should be made early in the process, prior to external capital investment. As you reconcile this, take some time to get a lay of the land now and what it may be in several years. Have a discussion that is open, thorough and practical. How can we determine the best unequal split? There are some guidelines you can use. It can be milestones based on owners’ expected roles and performance, or you can assign a weighted average to some of the aforementioned parameters to arrive at an “equity score.” There are several online equity calculators you may want to try. How about a vesting schedule? To really gauge the founders’ commitment, equity might vest over several years. VCs generally like to see a one-year cliff; if an owner leaves within a year of formation he/she walks away from all or most of his/her equity. Are there equity levels? First, determine and allocate shares for founders and then establish an option pool for key current and future employees. Explore phantom stock as an alternative incentive. Are there tax implications? Shares are often used to lure staff and talent. According to Internal Revenue Code Section 83B, company founders can elect to pay tax on unvested restricted shares when they are issued, at a presumably lower value than paying tax on them when they vest. The caveat is they may not have cash for the tax liability. Conversely, they can pay taxes on income as shares vest, which could be at a higher value. It can make a significant financial difference for owners, and they have a short window in which to make the 83B election. What about company valuation? VCs and founders often have a different opinion on valuation. At the company’s inception, founders need to look at valuation and equity, from a number of perspectives, both now and into the future, perhaps, five years out. Shareholder agreements should include guidance in the event of an exit. Will there be a put option or call option for founders who leave? Remember, buybacks can be expensive. Are there other VC considerations with respect to owner equity? Because shares will get diluted when angels and VCs enter the picture, it again necessitates that owners look at both the journey and the destination. Investors want a return commensurate with their risk level. Thus, founders need to have a vision and a long-term commercial strategy. VCs may recognize company limitations (technology, sales, and marketing) unseen by owners. In this case, founders need to be knowledgeable about the business’ prospective cash needs and the impact future dilution may have on ownership amounts. The conversation regrading founder’s equity is often overlooked or deferred while the focus is on making dozens of other, sometimes more exciting, startup decisions. 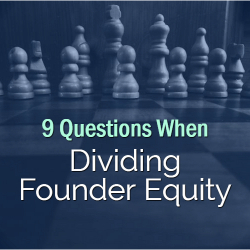 Dividing founder’s equity sets an important tone. Talk it through. Make every effort to avoid the “let’s just shake on a number and move on” approach. In addition to the economic ramifications, don’t discount the emotional ones, particularly if the new company involves friends or family members. Charles Weinstein is the CEO of EisnerAmper LLP. With more than 35 years of public accounting experience, Charly is an author and frequent speaker on the topics of governance, mergers and acquisitions, and public and private financing. Contact him at charles.weinstein@eisneramper.com. Great insight on dividing founders equity without being too formulaic.